The value of pipe #311 is n/a points. Lee Pattison is one of a kind. 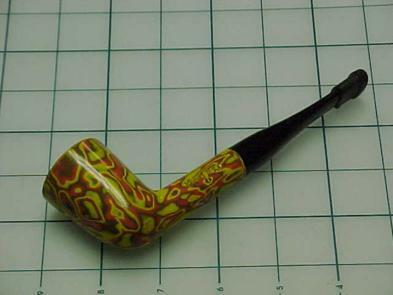 Out of the blue, every once in awhile he sends me a few pipes, including those I collect. All he asks in return is "Send tobacco when you get a chance." I am more than willing to comply, especially this time. He sent this California Style Dublin which earned him a pound of one of my favorite blends - Ugly Chuck's from Boston Stoker. He also sent a magnificent Hilson Fantasia Churchwarden which will, I am certain, appeal to a fellow I met who collects Fantasias—if I can find him. I have long wanted a California Style Dublin which I could feel free to smoke and now I have one! Thank you, Lee! I keep my smokers on the Pipes for Trade page and, frankly, never anticipated receiving an offer that I would accept for this fine pipe. But, surprise, surprise, Andrew Williams made me an offer I couldn't refuse, so he got this one in exchange for a couple of un-smoked pipes that improved the collection considerably. It will live in my memory on the Pipes Sold page.